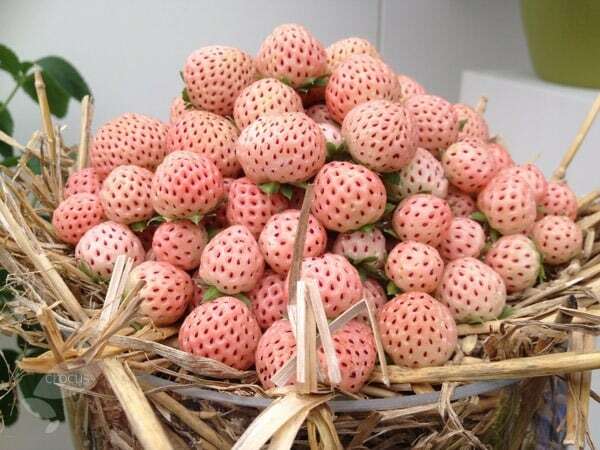 During the last summer, a well-known supermarket was selling these delicious and unusual fruits for around 25-30p per berry - and they were still in big demand! Now that the plants are available (they have only recently been released onto the market) you can grow your own. The juicy and sweet fruits are a taste sensation - just like strawberries but with the flavour of pineapple. It is the result of a cross between two different strawberry plants, one from South America and the other from North America. It flowers in May, and then the fruits appear, green at first but then ripening to white with deep red seeds. Ready to harvest in June, the fruits are rarely eaten by the birds as they do not think they look ripe, so you usually will not need to net them. Garden care: It prefers a sunny spot. In winter, protect the crowns with straw or glass. Grew them spilling out of an ornate hanging basket. Plenty of fruit and lovely flavour. Looked unusual too and the theory that the birds don't recognise them as ripe fruit because they are white seemed to be true. Plenty of delicious un-pecked fruit! An exciting new addition. Plant was dispatched after 2 weeks like I was advised. It arrived within a few days of being dispatched. The plant itself looks healthy, nice bright strong green leaves, a good size and strong roots. It was packaged extremely carefully meaning it arrived in perfect condition and the soil was damp so it didn't suffer in the hot weather! It's all repotted now so fingers crossed for lots of yummy berries! I already have a pineberry which is currently flowering and can already see buds on this one! The plants were well packaged and healthy when they arrived. I had ordered them as part of a project that I was completing with my class of Y3 primary pupils. We planted them in the school garden and they were well tended by enthusiastic, budding gardeners. Sadly no fruit was produced. Hi I've had this plant for over a year and unfortunately it hasn't produced any fruit. I'm sure it's my fault and I haven't done something right! If anyone has any tips please share! However, it is a beautiful plant with lovely white flowers! Hello there For the a good crop of pineberries it is best to have a normal strawberry plant nearby for pollination purposes. Hope this helps. Hello, It is quite possible that the plants are concentrating their energies on producing leafy growth rather than fruit - particularly if you are using a fertiliser that is rich in nitrogen. If you want to push them into fruit production, then you should be feeding them with a high potash fertiliser such as Tomorite.